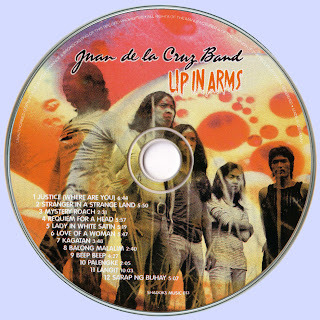 The Juan De La Cruz Band is one of the few less commercial electronic bands in the Philippines which claims to have more Western-orientated musician per square mile than any other country in the world. The impact of the group in the local hard and mellow rock scene is tremendous considering it was organized only 2 years ago. In December 1970, the band was featured in the first open-field rock festival in the Philippines, the "Antipolo Rock Festival." The bands popularity gained terrific momentum in September of 1971 when it reaped a singular honor in backing-up the "Jesus Christ, Superstar" rock opera production at the Cultural Center of the Philippines (CCP). Then in December of the same year, the band garnered its crowning glory when again, for the first time in the Philippines, a rock group on its own, backed by a full symphony orchestra (the National Philharmonic) was presented in concert at the prestigious CCP. No other group in the Philippines gained so much greater heights of success in relatively a very short span of time. This album debut is a monumental testimony. It is the first venture of it/s kind in this part of the musical globe. The Juan De La Cruz Band now reaches for a wider audience. Tracks 7 - 12 are not from the original album. They're released only as a very rare livetape in 1974 and the tracks are from either their second album Mascara or third album Himig Natin , and some where unreleased tracks too. On Mascara and Himig Natin the band had menbers of the Japanese band Speed Glue and Chinki. On those albums Mike Hanopol joined the band who also made several famouse and rare solo albums. Wally Gonzales, the guitarist of "Up In Arms" and all other Juan De La Cruz Band albums released also the very rare solo album On The Road. This album "Up In Arms" was found so far only ones by a collector and the value of it would be something like $ 3000 or more, if a few more copies turned up. The later albums Mascara and Himig Natin have both a value of $ 1000,- and are very hard to find in nice condition. The same price and quality problem goes for Wally Gonzales and Mike Hanapol/s solo albums. Nothing realy survived from way back then in the Philippines. There was also a close relation between bands from Japan and the Philippines, but the musical influence is USA. Most releases go in the direction of heavy Psychrock with an Progressive touch. Juan De La Cruz was really a liveband (which you can hear on the extra tracks on this CD). They/ve played big audiences in the Philippines because not many Western band made it over there (maybe for political reasons). 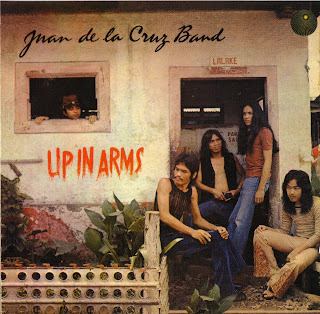 The Juan de la Cruz Band was a Filipino rock band formed in 1968. In December 1970, the band was featured in the first open field rock festival in the Philippines, the Antipolo Rock Festival. The band's popularity gained momentum in September 1971 when it backed up the production of Jesus Christ Superstar at the Cultural Center of the Philippines (CCP). Then in December of the same year, the band garnered its crowning glory when again, for the first time in the Philippines, a rock group on its own, backed by a full symphony orchestra (the National Philharmonic) was presented in concert at the CCP. The band originally had six members: Wally Gonzales (guitars and vocals), Rene Segueco (organ and vocals), Clifford Ho (bass and vocal), Romy Santos (wind instruments), Bobot Guerrero (drums), and Sandy Tagarro (lead vocals). Sandy Tagarro left the band before the band's first album "Up in Arms" was released. An incredible view into early '70s psychedelic rock madness, from the Philippines! Have a look at Hans Pokora book ' 2001 Record Collector Dreams' where this album is featured. The original LP' is almost impossible to be found today,but thanks to label Shadoks Music, reissue on CD is added six cool bonuses 30 minutes of extra live tracks released for the first time. Released in 1971'' Up In Arms''(sung in English) debut album, containing a piece of really great, catchy and very professional (and relaxed) made ​​music combining elements of late psychedelia with a dynamic, guitar, playing progressive (with enchanting parties saxophone and Hammond organ) is regarded as the best album this of band, from the early '70s. Hard rock with psychedelic touches and particularly fine guitar work... Wally Gonzales burns the fretboard like a man possessed. Pure exotic hardrock galore !!!.. and of course, there was no one in composed the name of Juan de la Cruz,it was their national hero! Nobody in their right mind would say that the Philippines could be placed within the context of rock, especially considering the internal politics of the country and then we're talking about. But those who think that the scene did not exist in this country in the early 1970s. And who can counter this theory is the group Juan de la Cruz Band. Responsible for launching one of the hidden treasures in hard rock, the group debuted in 1971 in the Philippine music industry world of garage bands with this which is considered one of the best of his country and true object of desire of collectors. Extremely simple, heavy, this rock band has on guitar and vocal of their leader, Wally Gonzalez, some songs that show the claw grip and this great band. Starting with 'Justice (Where Are You)' already puts the crash to happen. The guitar is constant throughout the song, and it shows the other side of the world it is also possible to make a beautiful rock and roll. The technique of the musicians surprised by how raw, natural and heavy soils that developed and how the tracks sounded like any band or American English. The second track is a ballad of extreme beauty called 'Stranger in a Strange Land', and showing that the band also had poetry in his lyrics and composing melodies and harmonious quality. Side A has yet 'Mystery Roach', Frank Zappa band. Mind you, the guys in the Philippines in 1970 recording Frank Zappa when he was still in his early work and has not had all the fame and status to conquer from the years following. Already 'Requiem for a Head' is almost a jazz rock with the right saxophone solos and give extra charm to the band plus an irresistible hammond organ strolling throughout the song. Already the band 'Lady in White Satin' highlighted a flute Romy Santos a wonderful work. The album ends with 'Love of a Woman', that despite the good work of the guitarist, perhaps the weakest of the album, but even so the final balance is extremely positive. The album cover is anthology, showing "japinhas" hippies with those guys and if someone looked at them would ever say that this is a great hard rock band. The following year, the Juan de La Cruz ain the launch Shake Your Brains, another very good record, now as a trio, but still without losing the category, strength and simplicity. In his career Juan de La Cruz would edit a few other albums unless quoted. Despite the fame that this was one of the first rock groups of the Philippines, the album at the time was a commercial failure. He is currently one of the classic rock world rare in many parts of the world. "Nobody in their right mind would say that the Philippines could be placed within the context of rock." Sorry; late to reply. While I appreciate a non-Filipino taking interest in the music, I have to ask. Why start with such a presumptuous, not to mention ill-informed, and yes, seemingly racist statement? Please understand that rock and roll in the Philippines has been around since the late 50s and early 60s, with acts such as Eddie Mesa, Jose Mari's Electromaniacs, RJ and the Riots, and The Downbeats, just to name a few. That said, Juan De La Cruz Band were not one of the first bands of the whole country by any means. They were indeed one of the first bands to sing in Tagalog, which is the Philippines' primary language besides English. Yes, the Philippines was a socialist dictatorship at the time, but JDLC were one of the top forerunners of the Manila Sound alongside Hotdog, Sampaguita, Maria Cafra and Anak Bayan. Keep in mind - this is only the Philippines we're talking about; not some place like China, Iraq or Iran. Just a heads up.